This 'how to' book will give every working person (anywhere) tips, tricks, and trade secrets that will make your working life easier and more streamlined. The book navigates you through what to do on your first day of work (adding your contact information to your boss' contacts) to what not to order at a cocktail party to planning an airport meeting, plus so much more. The questions to ask - always keeping you prepared. 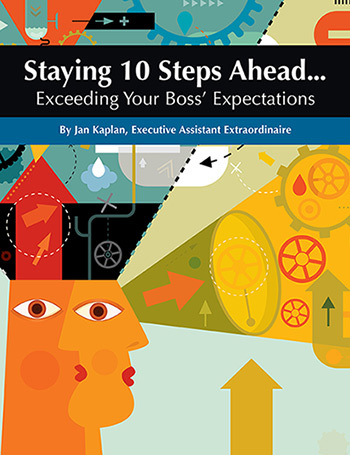 It will help you make your boss look like the rock star, and most importantly, it will keep you shining where it counts... keeping your boss in the know... and you, always 10 Steps Ahead! Purchase our new book here! $50 $200 $1,000 $5,000 How many times? If you have a coupon code or discount code for this book, please enter above.